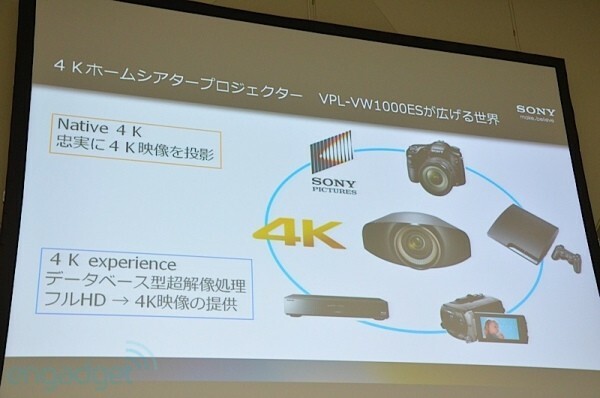 Expect to see 4k as the standard for next gen. Though i understand you likely meant this in jest, I still direct this at anyone who actually does believe in such a foolish notion. Hell 3D wont even be standard still. In any case this means absolute bunk, as all this is is a glorified still image viewer, not video. And unless you have yourself a fantastic projector or a consumer 4k tv from 6 years into the future, it's worthless. Playview allows 4k to be usable on a lower resolution monitor just like the PS3 picture viewer does for even higher resolutions with zooming. If you read the posts, Playview is a text, music, picture and movie viewer. Demos have shown text, pictures and movies (3-D for both possible) embedded in the electronic document. What sparked the discussion is the Pulp Magazine being released at 4K by 2K with pictures and text. An assumption that this is also video at 4K sparked the discussion on support for 4K. It's doable but I doubt that they are currently supporting 4k video. The bandwidth for supporting 3-D is 2x 1080P@24hz and 4k is twice 3-D after it's decoded and ready for display. On the blu-ray disk for instance, 3-D requires 50% more storage space than 1080P and 4K requires something less than 400% more after compression and at least a 4X drive speed. Edit: h.265, a codec that requires more powerful hardware can allow nearly twice the compression of h.264. This may allow 2X blu-ray drives to support 4K and dual layer to have enough space to store a 4k blu-ray movie. In the 2010 demo at CEDEC it was mentioned that Sony has an engine to process the media to make the Playview file. Part of that process is probably encryption for DRM. That playview technology is being and will be used in Sony games and the assumption that Sony will want Playview media on as many platforms as possible makes me believe that it is using webkit support libraries for much of it's functionality. Webkit with the proper support can display 3-D and 4K as that is only a limitation of the platform and player. Google Chrome, a webkit browser, is demoing 3-D video and higher resolution YouTube video. So it's possible for Playview to support 4K video, Sony may do so eventually. Edit: Playmemories Studio for the PS3 supports Zooming and Panning for Video and pictures. This further supports both Playview media and Video from other sources in 4K format being downscaled on the PS3 with Zooming and panning ability. And you know this based on all those 4k movies you've A/B'd in theaters? What a silly statement. It's mathematically demonstrable that 2k movies at typical theater size/viewing distances are nowhere near the limits of human vision. 4K will appear on PC monitors long before it ever surfaces on TVs, and guess what? its not even close to being introduced yet! Do not want anything higher than 1080p next-gen. Just try and reach that goal (and 60fps) first before making false promises. In 2009 articles were speculating on the use of the then breaking news that GE's plastic division (purchased by the Saudi family) had produced a plastic for blu-ray disks that had a high enough reflectivity to support holographic blu-ray which would allow up to 1 Terra-byte disks. The speculated use was for a Wii HD, PS4 and Xbox720 and projected release dates of those new platforms 2011 when GE said that consumer drives might be available. The as-yet-unnamed disc format was unveiled earlier this week at an international symposium of high-tech companies held in Kauai, Hawaii. The International Symposium on Optical Memory and Optical Data Storage (ISOM/OSS) featured presentations by Hitachi, Mitsubishi, Samsung, Sony, and a number of prestigious Universities and research labs from around the world. An emerging new standard for video is called 4k Resolution, which has 4,000 lines of horizontal resolution. GEs micro-holographic discs would be ideal for storing videos in 4k Resolution as the video size will undoubtedly trump that of Blu-ray. It would also offer significantly sharper picture and color quality thanks to an increased level of detail. Projection from 2009 GE news release would have both PS4 and Xbox720 using these drives. So what does this mean? It means that Holographic Optical Media can be read by Blu-Ray devices but doesnt have to be limited to Blu-Ray technology. This also means that Sony and Microsoft could potentially build optical drives around the convenience of current and past generation media formats while embracing Holography for the most demanding of next-generation game development on the Xbox 720 and PlayStation 4. By 2011 holographic discs are already expected to be cheaper per gigabyte than the $1 per gigabyte ratio of Blu-Ray when it launched in 2006. I dont know about anyone else but the timeframe really seems to coincide nicely with the suspected launch of the new consoles in 2011. So is it possible that the PS4 could bypass a Blu-Ray only format for an HOM/Blu-Ray combo? And would this be a good move for Microsoft, especially given that a player that can read Blu-Ray can also use HOM? Well, time will only tell but I would definitely look forward to the consoles if they did use this kind of optical storage medium, given that storage capacity would no longer be a pang for developers. New drives will be backwardly compatible, cost about the same as current blu-ray drives but will be able to read disks with more than 10 times more information (500 gig and up). Having to rebuy movies on 4k, yay But still 4k would be godlike. Im just saying prepare to be sold new sets and resolutions all over again. After the market is saturated with 1080p/3d televisions, 4k is next. 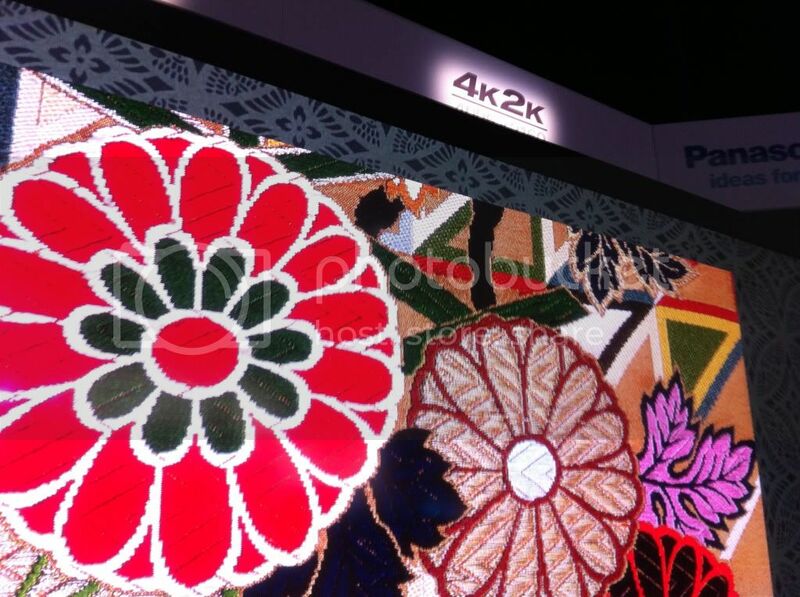 Sony testing the waters with 4k playview is a sign on the wall imo. That the games will hardly run smoothly or below that resolution is a given, obviously. That's what this gen showed us. I agree and missing in the picture below is a blu-ray player for 4K, that's coming. 4K for Media and most likely 1080P for games next generation. Sony started promoting BluRay and PS3, now Move, 3D and Vita. And after that I'm pretty sure it will be PS4 and 4K. As it now happens with 3D looks like with 4K they also will cover every related market, from cameras to projectors to content and displays. But aren't most digital cinema systems 2k? And they've just spent a fortune upgrading to digital,they won't want to do the same again anytime soon just for 4k. They are commercial enterprises and they'll be happy with 2k and the benefits of digital distribution. cinema systems are generally 1.5k. There are, of course exceptions to this rule such as iMAX, which go upwards of 2.5k, then the iMAX's bigger and badder brother, the OmniMAX, which sports a native resolution upwards of 6k due to the immense size of the screen and the specialized equipment they use to make the moves that are projected onto the screen. Edit: PCs can already push resolutions exceeding 5k thanks to multi monitor technologies like eyefinity. PC Gamers can already get 1080p standard , unless its some janky, broken game put out by ubisoft or activision. 4K Cameras & TVs/Monitors are going to be crazy & people thinking that Sony won't push for 4K in the PS4 is out of their minds because it's not just about games with Sony they are going to push for 4K in the PS4 so it can be used to help sell their 4K TVs , Cameras & Movies. Agree 100%, following your cite proves it. Put some pictures in your post and link to http://image-sensors-world.blogspot.com/2011/09/sony-image-sensor-business-presentation.html which I found by reading your cite and exploring. Add to what has already been discussed for 4K Displayport and we have the support needed for 4K media in a PS4. Damn dude, sometimes I have no idea what your saying, but you were right on the money for the last few months when people were jumping up and down about you wearing a tin foil hat. Now will I ever see Cross Game Chat in my PS3? Bet on everything. One shall prevail! See you in 20 years time! Can't wait for 4K! No cross game chat. My guess goes something like this: PS4 Head mounted Virtual 3-D with 7.1 stereo killed cross game chat. In 2009 I don't think they envisioned 7.1 stereo when they thought the PS3 and pulse audio could support cross game chat. RE: PS3 4K display, PS4 at 4K for media and 1080P for games; it wasn't just me predicting this. Fully a third of the posts by about 5 posters were speculating the same thing. Just for the most part qualified that the penetration for the monitors/display will wait for the price to drop which was obvious. jeff_rigby Bet on everything. One shall prevail! Multiple points I have made over the last year have already been proved with the Charles Ying post. More proof coming. It should now be obvious if you have been following the browser thread. Repeat of message 202 with new information edited in. Cell processor and large video buffer memory in the PS3 being used to support up and down scaling of video as well as zooming and panning. If anyone has viewed 720P video on the PS3, you can stop/pause on a frame and it's a perfect one frame picture. I can imagine Playmemories allowing you to save a frame or a Zoomed section of a video frame as a jpeg as well as annotate it. Lots of features that haven't been explored or as least as a consumer I'm not aware of this. Playmemories will be available for all other platforms Jan 2012. Is 4k something I should be concerned about catching on? I've heard it mentioned a lot in the past few days. No, not anytime soon. In 10 years though, yeah the tech will probably start permeating mainstream by then. 1080P to 4K upscaling blu-ray players announced by Sony for this year. Sony consumer video cameras supporting 4K are rumored to be out this year with prices to drop rapidly over the next few years. You can already buy 14 megapixel still and 1080P Video combination cameras for under $100. The 14 and coming 16 megapixel sensors exceed 4K but the data path and flash memory is not fast enough to support 4K video but with 28nm die process now and 20nm coming soon, that part should be solved. For the first time, I think since 16mm film (50's & 60's), consumer cameras will exceed broadcast standards and home TV display standards. How will you display 4K media? downscaling and zooming.......what does the PS3 cell broadband engine excel at < rhetorical question>. That crap is nothing but a worthless gimmick until actual 4K content arrives. That crap " 1080P to 4K upscaling blu-ray players announced by Sony for this year" is nothing but a worthless gimmick until actual 4K content arrives. Yeah, I wondered about that as Sony & Toshiba 4K TVs already have 1080P to 4k up-scaling so who benefits? My best guess is that in typical Sony fashion, they are holding back that with firmware update they convert to 4K blu-ray players. That or many more 4K TVs are coming than we know about. 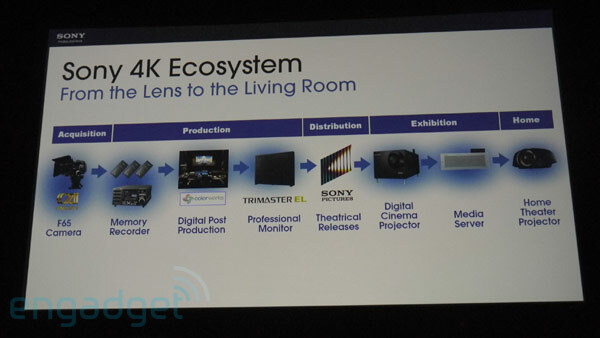 Sony does have 60+ 4K movies but must wait for h.265 to be finalized Jan-Feb 2013 before they can make the disks. Same production pipleline as with blu-ray 1080P but extensive encoding for 4K h.265. Encoder technology is different from a consumer h.265 decoder. The existing infrastructure isn't even nearly capable of pushing the bandwidth required for 1080p on every channel. It will take a widespread push for IPTV to become standard before anyone even thinks of 4K broadcasts. 4K monitors? Sure, they're not so far away, but the console manufacturers aren't going to create a console that supports resolutions TVs don't. ATSC 1.0 is using Mpeg2TS or Mpeg2 with frames not in order to help keep the RF envelope and power requirements steady. ATSC 2.0 is coming and the major difference is that it uses the h.264 codec over the same 6 Mhz TV channels. The broadcast industry just needs to support h.264 which should be easy but our TVs may not support h.264. Cable and Satellite companies can support h.264 now allowing them to move up to 1080P by firmware updating cable boxes, new ones support this I believe. ATSC 3.0 or 8K & 4K broadcast breaks with old standards and is not backwardly compatible. Every bit of two 6Mhz TV channels is needed for 8K and every bit of 1 for 4K. This requires a very high S/N ratio and new techniques for antennas and tuners that haven't been developed yet. It will use h.265 in addition to new technologies. But h.265 could be used now (or after Feb 2013 when the final draft is published) for IPTV and with Cable boxes and Satellite receivers using a 6Mhz channel. Only problem is that there is not enough bandwidth & accuracy for true 4K but some lesser resolution above 2k and less than 4K is possible.